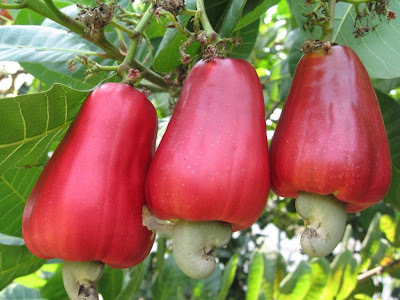 The cashew is a tree in the family Anacardiaceae. Its English name derives from the Portuguese name for the fruit of the cashew tree, Caju, the which in turn derives from the indigenous Tupi name, acajú. 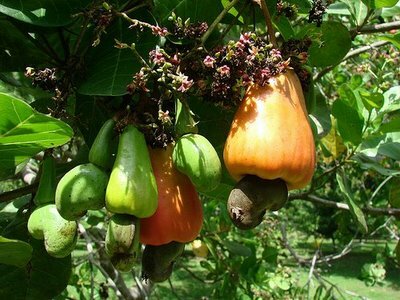 Originally native to northern South America, it is now Widely grown in tropical climates for its cashew seeds and cashew apples. The cashew nutshell liquid (CNSL), a byproduct of processing cashew, is mostly composed of anacardic acids (70%), cardol (18%) and cardanol (5%). Cashew is very commonly used in Indian cuisine. Goan cuisine in both raw and roasted whole kernels are used for making curries and sweets. The cashew apple is eaten raw or used in curries. The cashew nut can also be harvested in its tender form, when the shell has not hardened and is green in color. 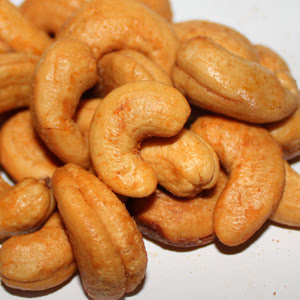 Cashew nuts also Appear in Thai cuisine and Chinese cuisine, Generally in whole form. 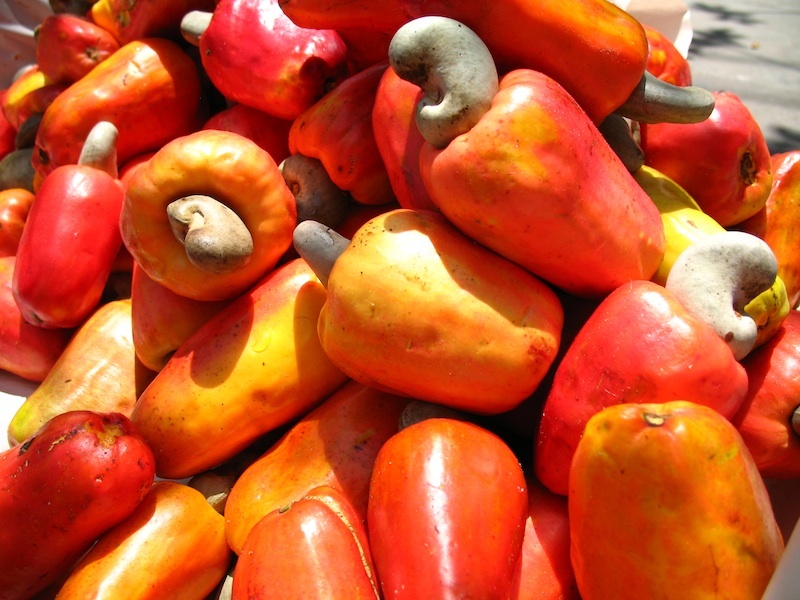 In Brazil, the cashew fruit juice is popular all across the country. In Panama, the cashew fruit is cooked with water and sugar for a prolonged period of time to make a sweet, brown, paste-like dessert called "dulce de Marañón". 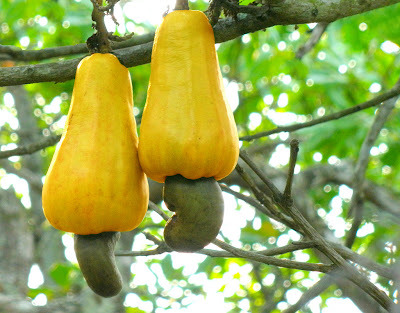 Marañón is one of the Spanish names for cashew. Pampanga also has a sweet dessert called turrones de casuy the which is cashew marzipan wrapped in white wafer. In Indonesia, Roasted and Salted cashew nut is called cashew nuts or cashews, while the cashew apple cashew is called (literally means monkey rose apple). In Goa, India, the cashew apple (the accessory fruit) is mashed, the juice is extracted and kept for fermentation for 2-3 days. Fenny / FeNi is about 40-42% alcohol. 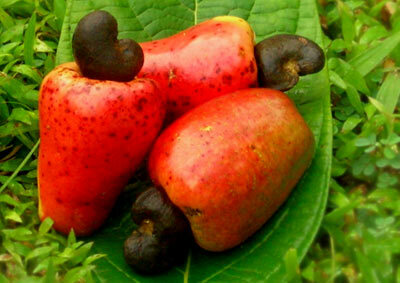 In the southern region of Mtwara, Tanzania, the cashew apple (Bibo in Swahili) is dried and saved. In Mozambique, it is very common Among the cashew farmers to make a strong liquor from the cashew apple the which is called "agua ardente" (burning water). Hola, felicidades por dar a conocer esta maravillosa fruta. Yo tengo un arbolito que hace como 15 anos sembraron mis padres y me decían que lo cuidara por que ya se estaba perdiendo en la región (sur de Veracruz) ya que cada día menos familias le tenían en sus patios. Es un arbolito muy generoso, pues sus ramas se cualgan de tanto fruto que da. las semillas se dejan secar y se tuestan en un comal.